Spinal cord injuries are linked to paralysis and can be one of the most terrifying injuries that occur as the result of an automobile accident. Before it happens, few people can comprehend the trauma of losing the ability to walk, talk or use their arms and legs and becoming dependent on others for life's day to day routine activities like eating, washing and using the toilet. Spinal cord injuries rank with blindness as the most feared of all injuries. If you or a loved one have been injured in an automobile accident and have suffered a spinal cord injury, please contact our Kitchener Personal Injury Lawyers of Ontario (ILO) team as soon as possible for a free consultation. Not every broken back results in a spinal cord injury, and not every spinal cord injury results in paralysis. There are several levels of spinal cord injury that result in various degrees of disability. The first is the most severe and that is complete paralysis. Total paralysis means no motor or sensory function other than neurological, which is, sight, hearing taste etc. Complete paralysis may prevent one from breathing on their own, or using or feeling anything in their body from the neck down, thus disabling the use of one’s limbs. Paralyzed individuals may require the constant use of a ventilator. Some individuals maintain slight use of their biceps but no control of their hands. At this level, the injured person has finger dexterity. The second degree of paralysis is incomplete paralysis level B. Level B incomplete paralysis includes the symptoms in level A, except that some feeling remains in the body and limbs but one is unable to move. Level C Incomplete is the third level of paralysis. In level C, a person is paralyzed in approximately half of the muscle groups below the neurological level. Although catastrophic for anyone suffering from this injury, Level D Incomplete is the least severe of all spinal cord related paralysis. In level D, the person has 50-99% of his/her motor and neurological functions intact, but is often unable to work at their previous profession or perform normal physical activities. According to one of the leading medical websites in the world http://www.mayoclinic.org, motor vehicle accidents are the most frequent cause of spinal cord injuries. There are several types of situations or events that cause the most spinal cord injuries in motor vehicle accidents. These include seat back collapse, roof collapse and most importantly, the failure of passengers in the vehicle to use their seat belts. The two types of motor vehicle accidents that frequently result in spinal cord injuries are rollover accidents and rear-end collisions. In a rollover accident, roof collapse occurs to various degrees and consequently, a person can suffer not one but multiple violent blows to the head in rapid succession. If a car flips many times, a person may experience multiple consecutive head jarring blows, often resulting in a broken neck and paralysis. Rollover accidents occur much more frequently today than in previous decades, as there is a proliferation of SUV's on the road. An SUV is a heavy, powerful vehicle but like a pickup truck, its higher center of gravity causes it to be unstable and top heavy when compared to other automobiles. Comsumerreports.org states that 30 percent of people killed in passenger vehicles were riding in SUVs. That's because SUVs are not designed with a roll cage like a race car. The roof collapses at least partially, nearly 100% of the time in an SUV rollover. This often results in severe injury or death to the SUV occupants. There are several things that you can do to make your ride in an SUV safer and reduce the likelihood of a rollover and the devastating spinal cord injuries this event may cause. Check the consumer reports rollover safety rating of your SUV. If you purchased a lower-rated vehicle, consider upgrading to one that has a higher rating. A higher rating means that there is less chance of a rollover and if a rollover does occur, the roof structure is more able to remain intact and protect you. Your chances of dying or becoming paralyzed are much greater in a rollover accident if you fail to use your seat belt. Not only may your head and spine be crushed by a roof collapse, if you are not wearing your seat belt, you can be thrown at a high rate of speed into the road, guardrail or even oncoming traffic. The potential catastrophic effects of not wearing a seat belt in an SUV rollover accident makes one wonder why anyone would not make wearing one a priority. Checking the tread wear of your tires and the air pressure at least once per month is an action that decreases an SUV's chances of rolling over and it's something that you can control. Make sure you have an adequate tire pressure gauge and check your tire treads. You may also want to take your SUV to your mechanic periodically to rotate your expensive tires so that they wear more evenly and also to have the steering realigned. Speeding, Distracted Driving, and Driving Under the Influence. Common sense tells us that following the law when it comes to speeding, cell phone usage or driving under the influence of drugs or alcohol plays a large part in the prevention of SUV rollover accidents. As these three conditions cause the majority of accidents and serious injuries in Canada, responsible driving practices are far less likely to result in injuries to you. If you have been seriously injured in a motor vehicle accident, early consultation with a personal injury lawyer will allow you to immediately concentrate all your energy on medical care and rehabilitation, rather than wondering about the many questions you likely have regarding your rights as an accident victim, how you go about making a claim, insurance reporting deadlines and paperwork, medical expense documentation, and the many other issues that can certainly create stress for victims and their families. If you have been the victim of the negligence of another driver in a motor vehicle collision resulting in spinal cord injury or other serious injury, please contact our Injury Lawyers of Ontario (ILO) law office. If you are incapacitated, we can consult with you in your home or in hospital. The local firms that make up the ILO have a track record of excellence, having successfully represented many injured clients in claims against negligent parties and their insurers. 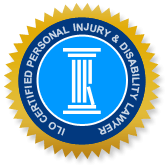 As well as motor vehicle accidents, we offer personal injury expertise in insurance disability claims, slip, trip and fall injuries, wrongful death, product liability issues, and other accidents that result in injury. We understand that serious injuries not only result in pain and medical challenges, but also cause significant upheaval and challenges in the family life, work responsibilities and daily functioning for accident victims. The attorneys and staff at ILO strive to make this difficult time easier for all of our clients. Call us today so that we can do the same for you.